Self-proclaimed “mama’s boy,” 27-year-old Chase McNary was one of the final three contestants on the recent season of ABC’s “The Bachelorette.” A Colorado native, McNary loves the outdoors and being active, including golfing at The Ridge at Castle Pines North with his mom with whom he has a very close relationship. Twenty-six men vying for the attention of one woman does not make for good odds, but it does make for good television. Local resident Chase McNary gave finding love a shot on the latest season of ABC’s “The Bachelorette,” making it to the final three at the end of the show. McNary was a fan favorite who says he had a great time while on the show. Currently on a leave of absence from his job in medical sales, McNary spends a great deal of time with his mom and stepdad who live in Castle Pines. “I love how this area is centrally located to both the mountains and downtown. I like my space and freedom and love calling this area my home,” McNary remarked. McNary attended Highlands Ranch High School and Colorado State University and is an athlete who continues to enjoy the benefits of living in this area. “I definitely have the itch for adrenaline on a regular basis. I love anything with speed and motors, but more often can be found mountain biking, snowboarding, golfing, driving my side-by-side or traveling. I spend most of my weekends seeking a new adventure, and that’s why I love Colorado so much,” stated McNary. McNary had a great experience filming the show and made some close friends with both fellow contestants and crew members in the process. McNary explained that the contestants and the star of the show were filmed and hooked up to microphones constantly so that there was a great deal of unseen footage, and due to editing, not all aspects of his personality came through. “Talking about my feelings and love isn’t an area of my expertise and especially not in front of a camera, so I was labeled as boring or lacking character. People who know me see the more adventurous, spontaneous, fun, active, creative person that I am. But I do think it depicted well my rational and genuine character. As one of the final four bachelors, McNary brought the bachelorette, Joelle “JoJo” Fletcher home to Castle Pines for a visit with his family. The show shot scenes in Daniels Park and at the home of McNary’s mom and stepdad, Sandy and Brad Pearce. Sandy thought the whole experience was a lot of fun. “It was delightful to have them come to our home. Everyone was extremely comfortable, although they edited out a lot of the funny stuff!” While McNary filmed the show, he was sequestered and cut off from all communication with his friends and family. His mom kept a journal for him of all that he was missing, including the Broncos search for a new quarterback. “Everyday I wrote down what was going on around here – things I wanted to remember to tell him. I gave him the journal when he got home, and he loved it,” she stated. McNary signed an agreement with the network not to speak about the outcome of the show, as it aired three weeks after he returned to Colorado from filming. Although he had to field constant questions and even had to avoid super fans who physically followed him around, McNary enjoyed attending “watch parties” with fans and friends and giving them behind-the-scenes information without giving anything away. “I watched every show live to see how everything was edited and to see what I looked like on TV. It’s weird watching yourself on TV, I can tell you that!” McNary remarked. Fans of the show were disappointed when McNary was let go by the star of the show, and he was initially shocked and confused but ultimately felt good about the outcome and has no regrets. “I had a great time on the show, and I grew in a lot of ways that I would not have otherwise. It has opened up other doors and opportunities and has really been a positive experience,” stated McNary. McNary was in serious contention to be the next bachelor for the network’s upcoming season of “The Bachelor,” but it ultimately went to someone else. “I knew they were taking steps with a couple of other former contestants, and I deliberated with my friends and family about potentially taking on that role, but I’m not saddened that it’s not me,” McNary stated. As life returns a bit more back to normal, McNary is traveling and taking advantage of the many opportunities that are coming his way. Located just south of the Village Square commercial district, Lagae Ranch is a 249-acre planned development that includes Elk Ridge Park and three additional neighborhood parks, American Academy Charter School, up to 231 single-family homes, 400 multi-family residences, an additional elementary school, 76 acres of open space and trails, and 400,000 square feet of civic/commercial land uses. With excavation currently underway, it is estimated construction will occur over at least three years. Current work includes grading activity, widening of Mira Vista Lane, the first phase of realigning Lagae Road and other road improvements. Home models are anticipated to be built and marketed in early 2017, and be in production by mid-2017. Current market conditions and other factors may allow for construction and absorption of six to 10 single-family homes per month. The Lagae Ranch development includes the construction of a roundabout at Lagae Road and Mira Vista Lane. Additionally, Mira Vista Lane has been widened to three lanes to provide better access to American Academy school and Elk Ridge Park. Lagae Road will be routed further to the east and connect with Happy Canyon Road to the south (estimated spring 2017). Monarch Boulevard will be extended to connect to the new Lagae Road (estimated winter 2016). Access to Gate 5 at Castle Pines Village will be provided along a newly constructed road to intersect with Lagae Road (continuous access provided). Lagae Ranch was included when the City of Castle Pines was incorporated in 2008. The first development occurred with the construction of the American Academy Charter School, which opened its doors to students in the fall of 2009. Two years after completion of the school, Elk Ridge Park had its grand opening in September 2011. Development is underway on a 177-unit senior living complex located at the northwest corner of Castle Pines Parkway and Monarch Boulevard. Completion is anticipated by year-end 2017. 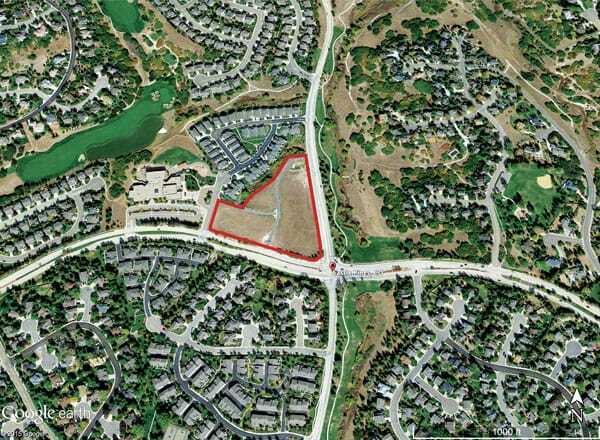 Construction of the Legacy Village of Castle Pines development at the northwest corner of Castle Pines Parkway and Monarch Boulevard in the City of Castle Pines officially began in August by the developer Western States Lodging (WSL). The senior living facility will include 177 units with 66 independent living, 80 assisted living and 31 memory care units. Currently, the existing roads, curbs, gutters, and utilities that were on site for a previous retail development are being removed. Next, WSL will grade the site and prepare to pour footings for the one-, two- and three-story buildings that will be part of the campus. The anticipated date of completion is fourth quarter of next year. IT’S OPEN! In partnership with Douglas County and the Colorado Department of Transportation, Castle Rock's largest ever roadway project is ready for vehicles. Drivers may have seen a new freeway exit sign off I-25 (pictured above right). We have all been watching the progress, and now it is time to start driving – Castle Rock Parkway is open to vehicular traffic. – The speed limit is 35 mph. Please drive safely and pay extra attention. – It may take some time for traffic to level out as we all find our new road routine. Traffic could be extra heavy on Castle Rock Parkway as motorists try using the new road. Meadows Parkway is still a good route to U.S. 85 and I-25. – At U.S. 85, there is a full interchange, so drivers can access both directions of the highway and Castle Rock Parkway. It is controlled by one signal span, so drive carefully and follow the signs and striping. – At I-25, a roundabout gives drivers access to all directions. Remember to yield to traffic already in the circle. The project broke ground in October 2013. The new road is expected to improve operations at the current Founders/Meadows Parkway interchange with I-25 and the intersection of Meadows Parkway and U.S. 85. It will also provide a second northern access for residents on the west side of town. The project is Castle Rock’s largest transportation project ever, and the road is a partnership among the Town, Douglas County and the Colorado Department of Transportation. Learn more about this significant project at CRgov.com/NME. 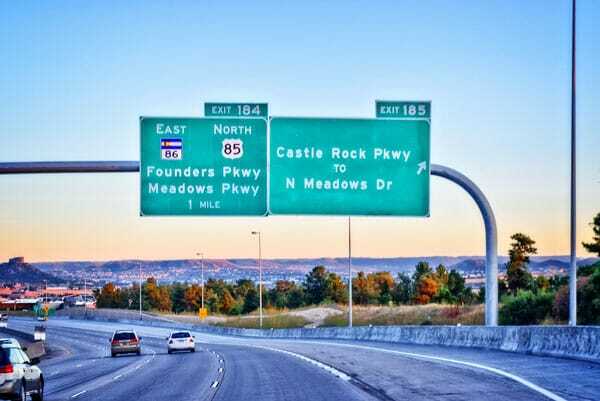 Castle Rock Parkway and North Meadows Drive now provide additional access to U.S. 85 and I-25 The speed limit for the new two-mile road is 35 mph. The Keep is a new 1,100-acre residential project located just southwest of Sedalia. Upon completion, it will have 64 home sites and 745 acres of natural reserve open space. Denver area developer Koelbel & Company has broken ground on its newest high-end residential project called “The Keep,” located southwest of Sedalia at County Road 105 and Keep Drive. Comprised of 64 spacious home sites, this 1,100-acre gated enclave with a 745-acre natural reserve blends the ultimate in privacy and security with easy access to shopping, dining and city venues. Homesites range from four to 10 acres and start in the $600,000s. According to the developer, the sites were selected with special concern for views, privacy, and the protection and conservation of native plants, trees, and wildlife corridors offering three different terrains: forested, rolling plains or scrub oak. On site, a proposed gathering space includes an open door pavilion with grills and firepits, creative agri-themed play equipment, turf for fun and play and more. The gated entrance to The Keep is accessible from US 85. Five preferred builders have been selected, including Gray Construction, Koelbel Custom Homes, Sienna Custom Homes, Sterling Custom Homes and Thomas Sattler Homes. The first phase of The Keep is available now and will consist of 20 homesites ready for building. According to Koelbel & Company, in 1861 when Colorado was still a territory, the land now designated as The Keep was offered to settlers in quarter-section parcels. Then after five years, the families were allowed to purchase their land from the federal government for $1.25 per acre. The land remained largely open as it is now, with pasture cattle and wildlife as the primary inhabitants. Cherokee Ranch & Castle owner Tweet Kimball eventually bought the property and used it for her Santa Gertrudis cattle ranching business for approximately 50 years. Koelbel and Company purchased the land from the Cherokee Ranch & Castle Foundation in 2000. To learn more, visit www.thekeepcolorado.com. Caissons for the RidgeGate bridge being constructed. To the average commuter traveling on I-25 past Lincoln Avenue and RidgeGate Parkway, it may appear that besides a lot of dirt being moved (close to 160,000 cubic yards to be exact), not much else is being constructed on the new light rail extension project. However, when looking beyond and under the dirt, the building of foundations for two of the line’s bridges is officially underway. And, when the Southeast Rail Extension project is complete, there will be a total of three new bridges. One bridge will be constructed over Lincoln Avenue as the rail line heads south to the Sky Ridge Medial Center area. An east-west bridge will span over I-25, from Sky Ridge to the future Lone Tree town square, and the third bridge will be built over RidgeGate Parkway to the end-of-line station located at RidgeGate and Havana Street. Each of the three bridges under construction on the project will be built with overlapping schedules. While the total construction duration for each bridge overlaps, the majority of the work will take place in late 2016 and 2017. When all three bridges are completed, a great amount of work remains before the project opens for revenue service in spring 2019. Construction has begun on the future end-of-line 4-level parking garage structure at RidgeGate Parkway. The garage will have 1,300 parking spaces. 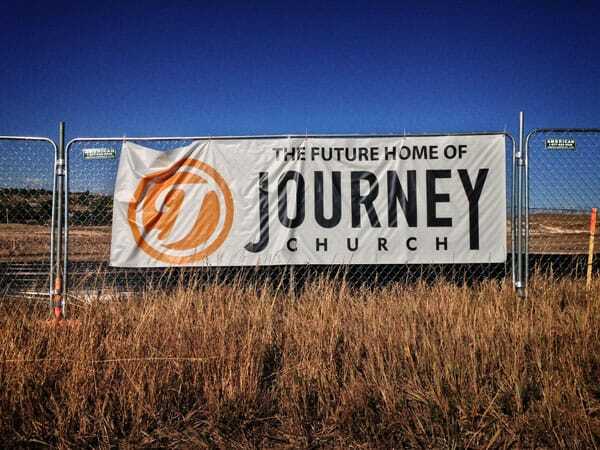 A temporary Journey Church sign hangs at the construction site where the new church will be located and a rendering of the 14,250 square-foot Journey Church currently being constructed. Construction crews have started excavating the 12.6-acre Journey Church site, located at 9009 Clydesdale Road. Situated between the Surrey Ridge and Oak Hills neighborhoods, the 14,250 square-foot, two-story church is the first phase of the church’s total 24,000 square-foot plan. The second phase includes an additional 9,750 square-foot addition to the church. Currently, there are no plans or timeline for the phase two project. A 350-seat auditorium for services will be on the main level, as well as a lobby, restrooms and refreshment area. The south side of the structure will be 43 feet tall and open into the lower level where six youth classrooms will be located. A nursery, toddler room and gathering area will be on the lower level. There will be 155 parking spaces. At the time the project was first designed, the church planned to hold two Sunday services with approximately 600 people attending the gatherings. Since that time, Journey Church in Castle Rock closed its doors and is planning on merging its congregation with the new Journey Church. The parishioners hail from Parker, Bailey, Highlands Ranch, Aurora, Castle Rock, Englewood and Centennial. “If the congregation grows, more services will be added,” noted Pastor Scotty Priest. Weekday programs will also be held in the building, including youth events. There are no plans to open a school at this time. For more information about the church, visit www.journeycolorado.com. The final drive-through household chemical roundup this year will be held October 1 at 175 Kellogg Court in Castle Rock from 9 a.m. to 3 p.m. The event is offered free-of-charge to Douglas County residents. However, participants will be asked for a $25 contribution to help offset the high costs of hazardous waste disposal and will be asked to verify residency. For more information, including a map and a list of acceptable items, visit http://www.tchd.org/. Douglas County recently announced a two-way data-sharing partnership with Waze, the free, real-time navigation app. This collaboration will assist those who live, work and play in Douglas County with important information about current road conditions and construction projects to assist their commute around the county. “We know that one of the most common feedback items throughout Douglas County this time of year is the amount of construction occurring on our streets and highways,” said Douglas County Commissioner David Weaver. “Our data-sharing partnership with Waze will help us be where our citizens and taxpayers already are – using Waze to navigate their real-time travels throughout the county with comprehensive information about cone zone areas,” he said. Waze, the social navigation pioneer, leverages mobile technology and community to redefine expectations of today’s maps. Waze is home to the world’s largest network of drivers who work together daily to outsmart traffic and save time and money. The app consistently recommends the fastest routes based on real-time driving and data from millions of users. From traffic reroutes to low gas price alerts and relevant offers from favorite brands, Waze is said to be one of the most comprehensive driving companions in the marketplace. To find out more about Connected Citizens, visit www.waze.com/ccp. To download the free Waze app for iOS or Android, visit www.waze.com/get. The Douglas County Sheriff’s Office (DCSO) is eager to alert residents to a new scam that is currently taking place throughout the county. This scam involves a phone call by someone claiming to be a person of authority who is providing a public service by letting the person they called believe that a loved one has been in an accident or some other catastrophic event. The caller then aggressively attempts to extort money from the person they have called, in order to supposedly help their loved one. This aggressive behavior is intended to cause emotional distress so that the person who was called feels compelled to meet the demands. The DCSO is encouraging people to be aware of these scams and take the following precautionary steps if receiving phone calls requesting money. First, attempt to contact the loved one that the caller is referring to. If contact is not made, ask the caller for specific information such as the name, agency and identifier, the name and rank of the commanding officer on scene, or which police agency is handling the investigation. The DCSO suggests that if the call is legitimate, the caller will be able to answer detailed questions. However, at no time should anyone give money over the phone in these situations.